Note: check the parts in the package as the packing list, some option parts may be not in the package if do not order. 1. Put the unit on the flat workbench and select suitable nozzle to install(refer to 9.2). After that, put the handle on the holder. 2. 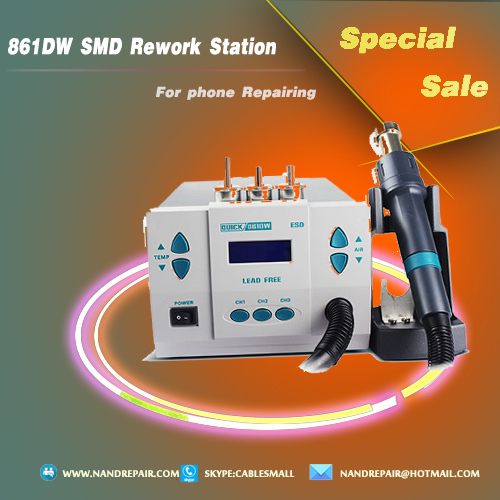 Insert the power plug into the power socket and then press the " Power" key, Switch on the power supply to the SMD rework system. 3. Take down the handle from the holder and the system comes into the work state. when the temperature is table, the temperature window displays" Real Temp"
4. if in the unlocking state, it can set the temperature and the airflow. 5. If in the locking state, it cannot set the temperature and the airflow and after getting the power supply, the display shows"no" before into working. 6. After working, put back the handle on the holder, after that, the unit comes into the cooling state and when cooling down to 100℃,the unit comes into sleeping state. 7. If not use in a period of time, it must turn off the power switch and cut off power supply. ②Press " AIR ▲" or " AIR ▼" keys to move the cursor among the hundres, then, one-digit. (3) Finishing the first password input, click key "CH2" into the secondary password input, the cursor of hundred twinkles. (4) If the next passwords are not identical, the setting of password is not successful and the window displays "no", After that, the system comes into work state and the password is still the former one. (5) If the next passwords are identical, the setting of password is successful and the unite display"SAV___" and has sound( run sound function). After that, the sytem comes into work state. 2. If the password is not the initial password 000, it must input the correct password before into the password setting interface. (1) Input the password: Turn off the power switch firstly, and then press a key "CH2" and turn on on the Power switch, Not loosely the "CH2" key unil the window displays "C". After that, the window displays_" Password" and the cursor of hundred twinkles, Which means the system coes into the password-inputting interface, There are threee times to input the password, After three time, it will exit the password-inputting interface and into the work state. (2) If the password is not correct: the display shows" no" and then comes into the work state. (3) If the password is correct: the display shows" SET" about 20 seconds. a. during the 20s of displaying" SET": Click " CH2" into the password setting( refer to the password setting at the initial state). If input the initial password"000", the system comes into the unlocing state, or else, it can set a new pasword. b. During the 20S of displaying"SET': click "CH1" or "CH3" to exit the password setting the come to the work state. c. if don't do any operation during the 20S of displaying "SET": The system comes into the work state. in the initial state, it can change the password directly and without input the correct password "000" first. After setting a new password in the inital state, it must turn off the power witch and then turn on it, and then the locking function of the parameters setting comes to run, or else, it can change the parameter after changing the password.